The past few weeks I have been working on a new design for 2018, one which has a message that to me 'says it all' as I prepare to step into another year of living the gentle domestic life. Mr E and I celebrated our 26th wedding anniversary yesterday and the plan was to pack a picnic tea of corned beef and pickle sandwiches and enjoy it down by the Marina after sunset...if the temperature cooled a bit. Alas, the temperature stayed high and it was really muggy (humid) which brings on my migraines so my beloved rang our favourite Indian restaurant, praying they'd accept a last minute booking, and they did. Thank you Lord! Having a back up plan, being flexible, prayer, they all remind me of marriage, and in fact they have each been important to our marriage, to the ebb and flow of its trials and joys, the lean times and the prosperous, the dark grieving times and the blessed events we get to celebrate, the plans that fall through and the ones which seem to slip into place without a hitch. I'm almost 59 and as I reflect on growing older, celebrating another year of wedded-ness as Mrs Reynolds, and preparing to welcome a new grandchildren into our fold in a couple of months, my heart feels more settled that it has been before. I'm becoming comfortable in my own skin, loving the ever increasing silver white patches in my hair, the softness around my eyes even though there are more lines appearing, the fingers that lose their stiffness when I draw on fabric with needle and thread, and the deepening desire to embrace a gentler life, a simpler life, one which treasures the hidden jewels within. Those personal reflections, desires and plans had a lot to do with this new design. One afternoon last month I sat in the shaded corner of my sewing room and sketched little bits and pieces, small things that made me happy, thinking they'd be nice as little motifs for different projects. And then I thought about next year and what I would like to focus on. So I put them all together and the next day slid my needle beside that first piece of applique and began to stitch. It looks gentle and I felt gentle as I stitched. The words slipped further into my heart and there was a sense of knowing this pattern was a reflection of my life as I'd like it to be. One big thing that can be used in many smaller ways. Like a big Sunday roast with leg of lamb and oodles of caramelised sticky vegetables. The roast is a delicious lunch on the day. The leftover veggies become tomorrow's bubble & squeak for breakfast when served with a poached egg and lots of tabasco sauce. 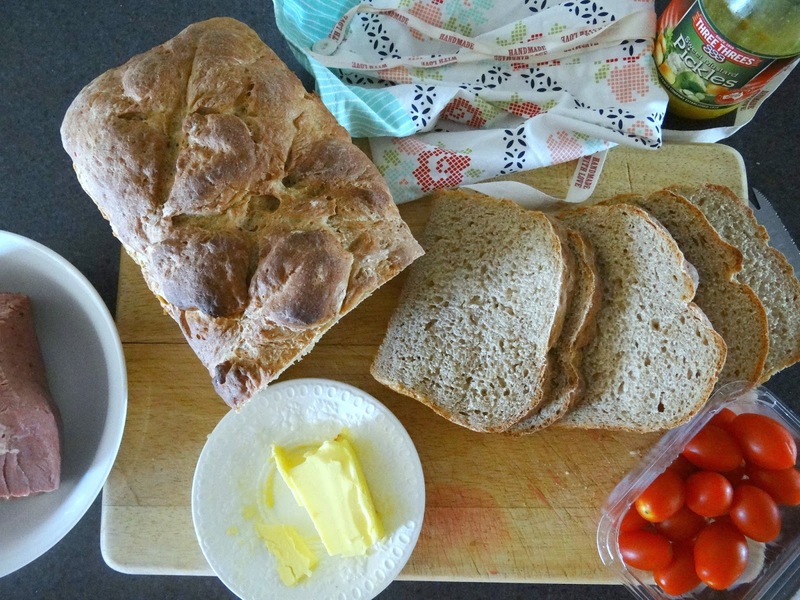 The leftover lamb fills sandwiches spread with mustard the following day, shepherd's pie a few days later, and then that big bone with all it's bits and pieces of lamb-y goodness stuck all around goes in the pot with vegetables, herbs and barley for a small pot of soup. One roast for a Sunday dinner becomes many more meals. 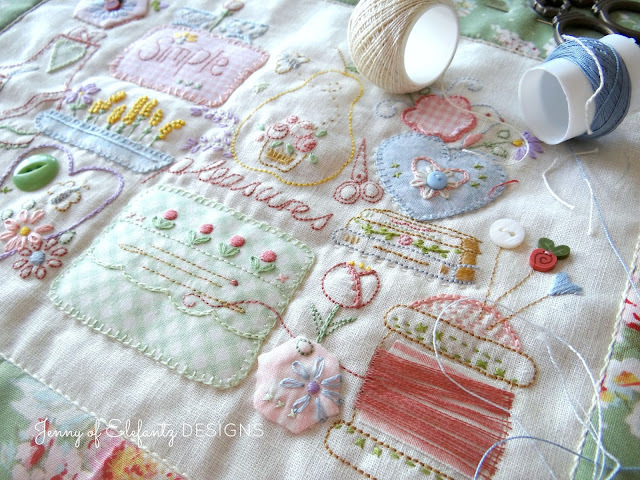 One large stitchery gives opportunity to become many little ones. It will become a bookmark tomorrow. In fact I'm going to make a few more bookmarks using other little motifs from the larger pattern, and pop them in my gift box. I didn't follow through on that plan this year but through 2017 I've been reading Annabel's blog once a week and can see now how thrifty, wise and fun it is to create throughout the seasons with whatever skills you have and come Christmas and birthdays, get wells and celebrations, or 'just because' days, there's a precious gift made, ready and waiting to give. No stress, just delight. If you visit Annabel's blog you'll understand what I mean. 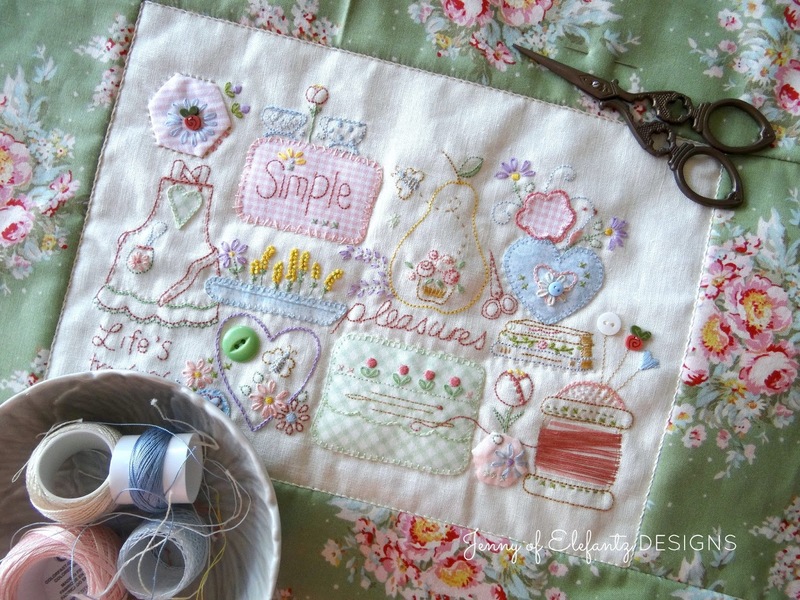 Stitchery Club members will receive this design along with two others in January (see more here). I want to add a bit more balance and order to my working/domestic days so I purchased two diaries for next year and they arrived a few weeks back. 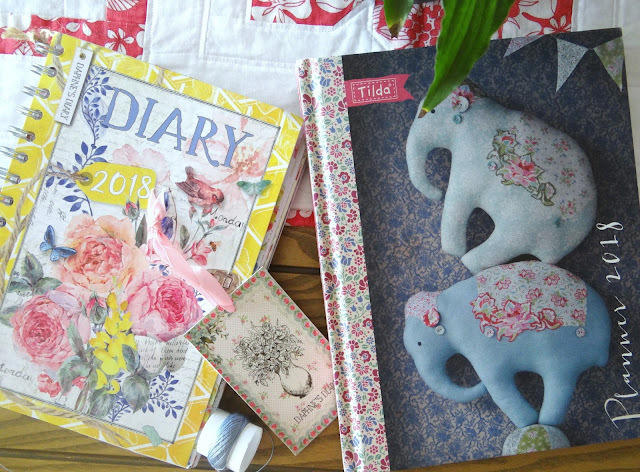 One is a Tilda planner for day to day business notes, and the other is a gorgeous Daphne's Diary for reminders about things which matter to my health - physical, spiritual and emotional - and it includes beautiful extras inside. Beautiful things inspire in so many ways, don't you think? For our anniversary Mr E bought me an elephant. 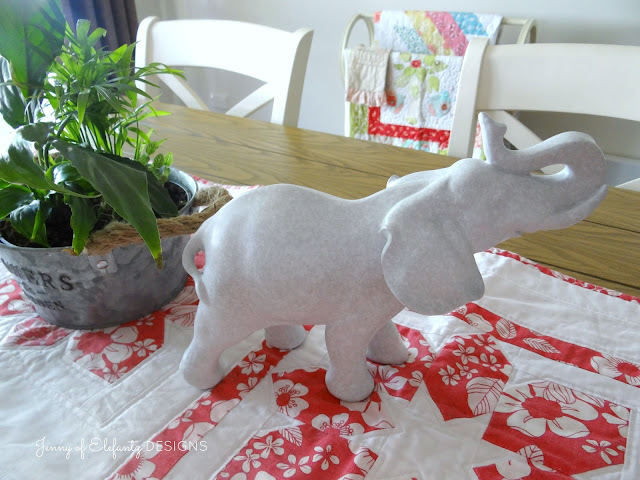 Funny how many people assume I love elephants because of my blog/business name (Elefantz with an f), but I don't collect elephants and the name has nothing to do with them. Back in 2004 I had a dream. In the dream I was sitting at a cafe having coffee with the Blossom-girl and I was writing 'elefantz' all across the white tablecloth in pretty cursive script like my Nana would have used. When I woke the next morning I thought God was giving me the name of a bookshop/cafe the Blossom-girl and I had planned to open when she'd grown up a bit more. She was just 11 at the time. My sewing life at that stage was nothing more than making simple dresses for Blossom or machining a straight seam to hem curtains. I had no idea that a few years later everything would change. I taught myself to hand embroider late in 2005 and in September of 2008 I penned my very first 'Jenny of Elefantz' blog post. I knew exactly what the dream was directing me towards. God has a sense of humour! 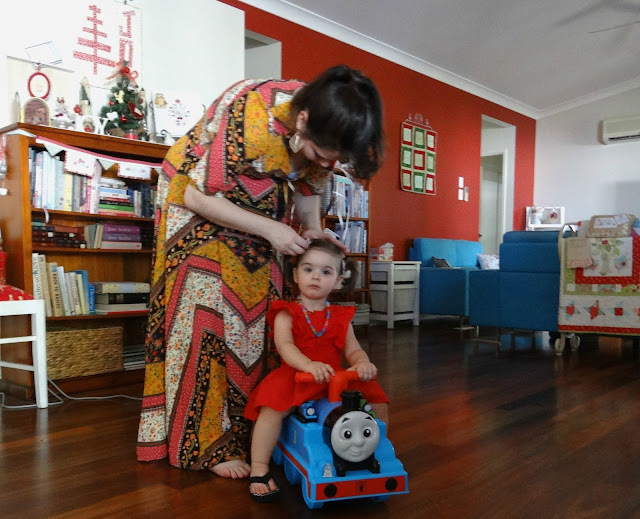 We didn't take many photos on Christmas Day...just two. It was such a special time for the five of us that it felt almost 'intrusive' to bring out the camera, so after those two pics I put it away. Mr E bought Cully May a Thomas the Tank ride-on. She *loves* anything Thomas! I snapped this just as Blossom was tying back Cully's fringe. Bloss made Cully May's red dress and it is gorgeous with those frills and a big bow at the back. Have I rambled again, wandering from topic to topic, following streams of thought and straying from one path? Sorry. Just so many lovely things that pop into my mind as I write and then I imagine we're chatting across the table about all and sundry...and this blog post may be that all and sundry. LOL! Well it's time to go fix dinner for my man and tonight we're having that picnic of corned beef sandwiches, but just here at home. With a pot of tea and gingerbread for afters. Relax sweet friend, ponder your simple pleasures and rejoice in the treasures of life that sit right before you. Let the rush pass you by and choose the gentler things that nourish your soul and bring joy to your heart. Choosing to live gently will bless you, and in turn in will bless those around you. Rather than making a New Year's resolution consider writing a list of things you can 'let go' of...ah, the freedom. PS: The first pattern in my 2018 Block of the Month will be shared on Monday. Yay! thyme is good for headaches, if you have some growing just pop it into a pot with your green or black tea (goes good with both) bruise it a bit before you pop it into the pot; i like to add lemony flavoured herbs to my tea, nice & refreshing. Ramble all you want Jenny. It is what makes your blog so very very special. Every time you post you lift my heart. All the best of life's blessing to you and yours in 2018. The beautiful cushion you made us still sits pride of place on our bed. Happy Anniversary you two! I enjoyed reading your Elefantz dream; I've always wondered too. 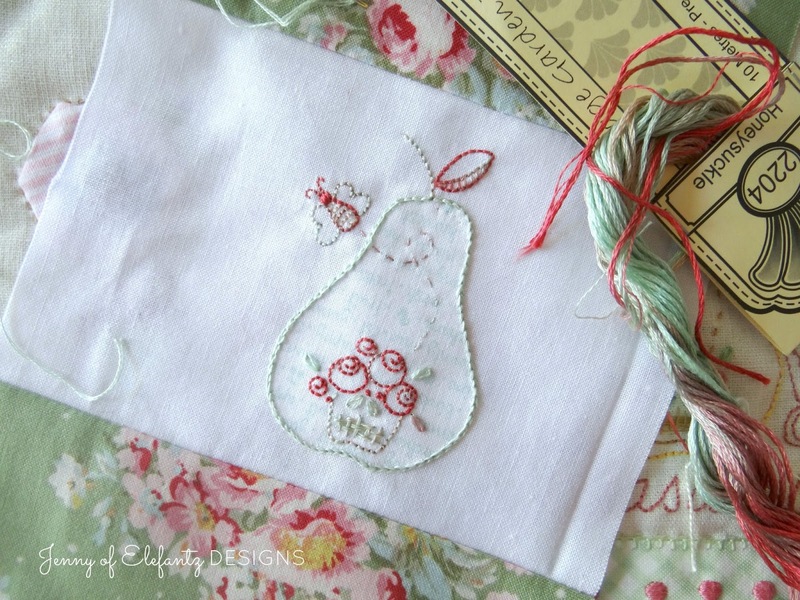 I love the idea of making bookmarks from the embroidery pieces. They not only make terrific gifts, but they would be easy to slip inside an envelope for mailing. I love the pic of your daughter and her little... the little red dress is beautiful! I hope Blossom is doing well. Thanks for all you do! I love reading your blogs. Keep it up. I so enjoy when you ramble-it's a wonderful way to get to know you! Or maybe it is because that is the way my mind works. I never seem to be able to keep in on a straight path. I really liked the story behind the "Elefantz" name. I hope Blossom is doing better and I thank you for sharing your thoughts with all of us. Hello Jenny; While you were "rambling" on, it just felt like friends having a great time talking with one another. Every part that you shared today was special and I enjoyed thoroughly. Congratulations on you and Mr. E celebrating another year of marriage! I am joyed that your day had a wonderful time. I am looking forward to a New Year and especially with doing your Block of the Month and Improving Myself as a Housewife. Thank you so much for all of your guidance Jenny. You are a blessing to me that the Lord led me to! Have a wonderful day! Jenny....God Bless You and Thank You. I am so blessed and inspired by your words, your spirit, and your gentle way. Thank you for sharing. Dear Jenny, count me in with all the other comments above. Reading your blog is a treasure each time, and usually just hits the mark of where I am. I'm a few years older than you, and married 46 years in a few weeks, but we are surely kindred sisters. Thank you, thank you. The embroidery is beautiful, the attitude wonderful. Happy Anniversary! Cully May looks adorable, and so does Ms Blossom. I'm glad you had a lovely time together. For me, take all the side trips you want in conversation. It's easy to follow you. =) Blessings and peace be upon you and yours. Lovely post, Jenny. Sorry that you suffered a migraine but at least you were able to share a meal with your beloved. Nothing better than an Indian neal either! Am loving this new design SO much.... will go beautifully with the peg bag I made using "find joy in the ordinary" stitchery. It is wonderful that you feel happy in your own skin. My hair started turning grey in my 20's so I coloured it. My youngest child was born when I was 39 (eldest when I was 20) and I coloured my hair till she started high school .... didn't want to be called "GRANDMA" when I went to pick up the two children lol. I have been very comfortable with my grey gair for the last 12 years. Love the idea of ageing gracefully ... some cultures revere their aged. Love photos from National Geographic of the aged in other cultures with deep life and love lines on their faces and eyes smiling out from sunweathered and crinkled skin .... so much character! Praying that your migraine has gone and you are able to enjoy your weekend spending time with your beloved. 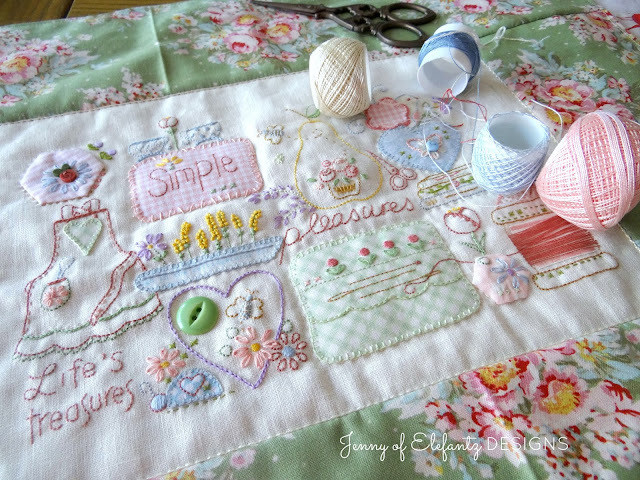 Looking forward to Jan Stitching! Your new sampler looks absolutely beautiful. I love it. I picked up some hand stitching today and love doing it. I made a sweet little gift for a co worker (late Christmas present). What a spectacular new design.... You have outdone yourself. Love reading your blog. Love you and your ramblings. I am a rambler too...I skip back and fourth between topics. And don't ever shut up. Just kidding ....I just love a great conversation . Hope Blossom is doing some better. Hard not to worry and wonder about her often...Culley Mae is a lil doll.... Blossom did a wonderful job on her dress. You are so talented. You amaze me. I used to embroider so much and do fine sewing... insertion laces and shadow embroidery, pin tucks and grub roses. Then I had a long time of more crochet and knitting. Being summer and about to be a new year I am trying to get my embroidery going again thanks to your inspiration. Dearest Jenny, I love reading your rambling. It is rather like talking to a friend and so relaxing. Cully May is such a pretty little girl and looks so good in her lovely red dress. I can't believe how big Cully May is now! She is such a cutie. Congratulations on your anniversary. Good that you were able to dine at your fav restaurant. The words of wisdom in your new design are so beautiful and good ones to remind ourselves of. Hope those awful migraines are staying away and that your creative juices are flowing. Hmm, another year before the big 0 then you will be on my side of the fence LOL. Happy Anniversary to you Jenny and Mr E.
I love coming here to read another one of your posts, you have such a beautiful way with words. I have been following Annabel for a few years now and she amazes me with all the things she gets done in a year! I like the idea of having a gift stash, and am working towards this goal this coming year. I am in the process of getting my sewing/craft room ready for creating, not long to go before it is finished. Happy 26th Anniversary. Love the new design you came up with and I always enjoy reading your blog. 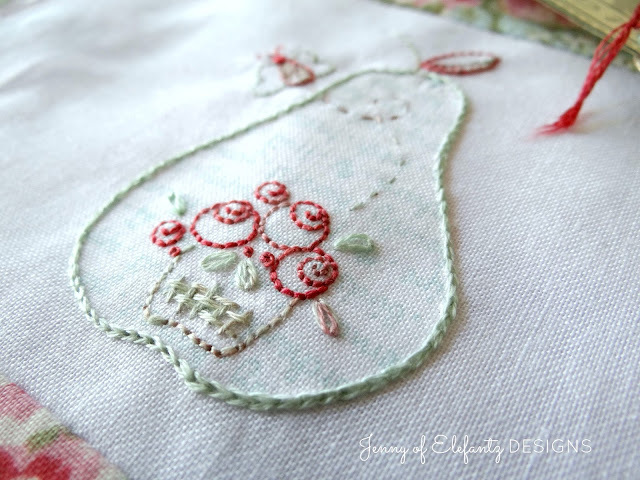 Love your ramblings as much as I do your beautiful stitching. Happy Anniversary my dear. Jenny I thought I had left a comment but mustn't have posted it properly. Oops. I love your 'ramblings'. To me it is like we are having a conversation which has these natural twists and turns. I have a goal to learn more about hand embroidery, so will be following along closely to glean as much as I can from you and the other talented ladies that follow along. Little Miss Cully May looks adorable in her Christmas dress. She has a wonderful Mummy and through gentle guidance will be a fabulous big sister. I hope the New Year brings as much and more as you could wish for. What a lovely post. Your haven’t rambled, just reflected. You Christmas Day sounded delightful. I hope you achieve everything you pray for in 2018. Love this post and its ramblings. That is how two friends enjoy a conversation. Plus your post are always so visually pleasing. Beautiful pics. Happy Anniversary! This is a beautiful design and post. Happy Anniversary to you both. We are off to Cairns on Monday for two nights to celebrate our 15th Wedding anniversary. I'm looking forward to it but apprehensive about leaving my children. My mum is 82 now and will have one 9 year old. My 73 year old mother in law with have the 13 and 7 year old. Fingers crossed no one gets ill or upset. All the very best to your gorgeous girl.